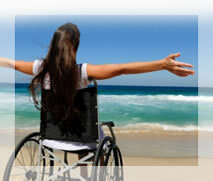 A world of accessible holiday opportunities awaits you! This online resource is designed to give disabled holidaymakers and carers more choice and flexibility when it comes to finding and arranging disabled holidays and activities. Whatever your disability, age or level of mobility, Disability Holidays Guide has something for everyone. Perhaps you fancy a short break away or maybe you’ve been dreaming about a far away destination? Then let us inspire you with our disabled holiday ideas, tempt you with discounts and deals and introduce you to companies in the leisure and tourism industry that can help make your holiday happen. Scroll down to reveal this month’s exciting getaways and hot offers or search the DHG Directory at the top to find what you're looking for. To make sure you get the best possible prices, we don't take commission from the companies or properties we featured and if any of the listings appeal to you, please enquire with the owners directly using the contact details and reference number provided. If you’re not sure where to start your search for disabled holidays, by all means contact us and we will try and point you in the right direction. New listings are added to the Guide everyday, so feel free to sign up to our monthly e-newsletter so we can keep you posted! Home to the Caribbean's first Brucker Biofeedback therapy center which uses a ground-breaking technique to assist patients in muscle strengthening and movement. This boutique hotel sits a stone's throw away from the Curacao Dolphin Therapy Center, Seaquarium Park and Seaquarium beach, one of the most beautiful beaches in Curacao, and is fully accessible to wheelchair users or guests with mobility difficulties. If you would like to enjoy the beauty of the Caribbean and relax in style and luxury, Dolphin Suites are tailor made just for you! Every hour, another person in the UK goes blind, which means more guide dog puppies need to be trained. Sponsor a puppy from just £1 a week, and you will receive regular Pupdates, so you can follow your puppy's journey to becoming a life-changing companion for a blind or partially sighted person. Your sponsorship will make a huge difference and change someone's life forever!